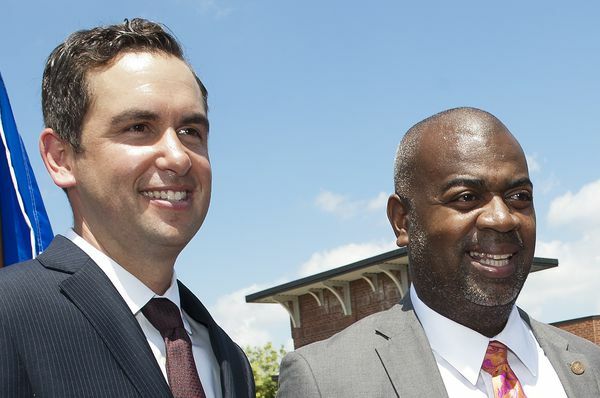 Jersey City Mayor Steve Fulop, left, and Newark Mayor Ras Baraka, seen in a 2014 file photo, are pushing for greater social justice provisions in legislation that would legalize recreational pot in New Jersey. The current version of proposed legislation would carry with it “deep-seated inequalities,’’ Baraka said. As we noted last month, to be fair, legislators must ensure immediate expungements of criminal records for past actions that will be legal under new laws. Far too many lives -- particularly in the black and Hispanic communities -- have been adversely affected by arrests and incarceration for low-level possession and distribution, a prime reason many support legalization. In order for those affected in the past to move forward, their records need to be wiped clean. State legislators are to restart their discussions on legalizing marijuana this month. They must listen to Fulop, Baraka and other mayors pushing for automatic and immediate expungements and get the legislation right.